Collecting Kisses + Why I'm happy my kids aren't babies anymore. 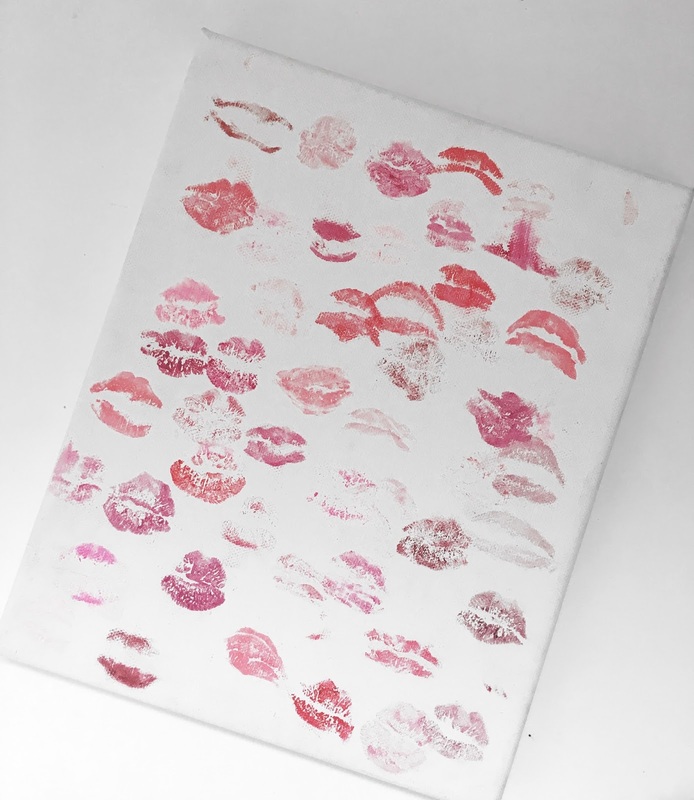 Friday Chit chat: Collecting Kisses Lipstick art project + Why I love that my kids aren't babies anymore. I’ve been collecting my daughter’s kisses since 2014 and I think it has turned out to be such a cute little piece of art! One of the things that I wish I while my kids were little was to do more projects like this, because I will have this canvas framed when it is full (almost there) and keep it forever. I used to play with my mom’s makeup when I was a little girl and I always had so much fun. I am obsessed with my girls tiny lips so I started having them kiss the canvas every time they wanted to try on lipstick and here we are 3 years later. 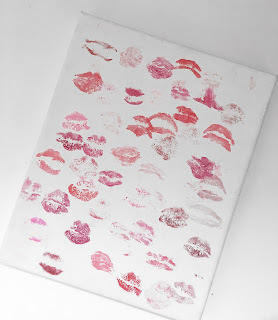 This is such a quick, easy Valentine’s Day craft idea if you have a little girl who loves to play in makeup :) All you need is a canvas and some lipstick. Put some lipstick on your little girl and have her kiss the canvas. Time has passed so quickly since my kids were born and I agree that the saying is true, the days are long but the years are short. I definitely miss being a mom to babies and toddlers, each day with them was and continues to be better than the last, but I am SO happy that they aren’t babies anymore! So many things change as your kids grow, you never really realize these things until you are experiencing it yourself. Here are some things I love about my kids being older. Now that we got that out of the way, here are my top reasons why I'm so happy my kids aren't babies anymore. 1. No more diapers. Even though the time passed quickly and really changing diapers isn’t bad, but I was SO glad when my youngest was done with diapers for good. Not only for sanitary reasons, but also because it was better for my budget. Diapers are expensive! 2. Less Stuff! OMG the stroller, the big, heavy carseat, the diaper bag, the high chair, all of the obnoxious baby toys…I do not miss those at all. Babies do require a ton of stuff that can clog up your house. I was happy when I got rid of it all. I have recently started moving towards a minimalist lifestyle, and it's so much easier without all the baby stuff around. 3. Free schedule. When my kids were little, they were on a schedule. Eating, napping, etc. Because of this, I had to plan my day around the schedule (as most of us do). It was nice to have structure but sometimes hard to stick with it every day. 4. More time to myself. Not that I didn’t have time to myself before, but in the summer, the kids spend all day long outside playing with their friends, so I get some quiet time inside to relax or do my chores while I watch my shows or listen to music. 5. I get to do more fun stuff. Not that I didn’t get to do fun stuff before, but when my kids were little, I didn’t really worry too much about going out with friends or going on a vacation by myself or anything like that. I just decided that I would do things whenever I felt comfortable. Now that they are older I have no problem with leaving them with dad while I hang with my best friends. I know that they will just play at home and have tons of fun. What about you? Are you happy that your children aren’t babies anymore? Do you have a baby and love the baby stage? Let me know!